— NASA transferred the title and ownership of space shuttle Endeavour to the California Science Center (CSC) during a ceremony Oct. 11 at the center in Los Angeles. The signing of the title was the first step toward CSC receiving Endeavour for public display in the latter half of 2012. In addition the title certificate itself, which CSC plans to have framed to display at the center, NASA had additional paperwork to process for Endeavour's transfer to proceed. "There were a number of other documents as you can imagine and those were prepared last week and have gone through review. What we signed today actually was the final transfer," CSC Vice President William Harris told collectSPACE. 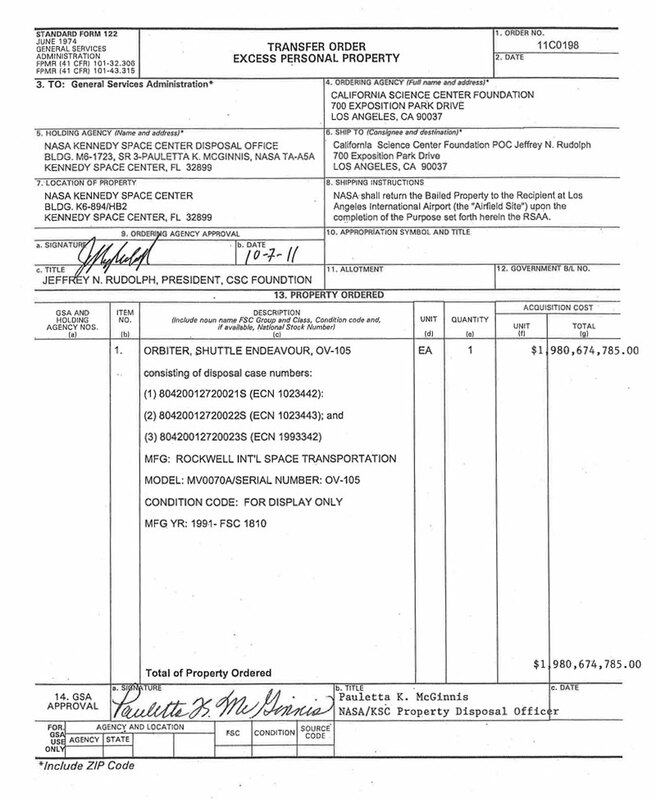 As an example of the other documents, CSC shared NASA's Transfer Order sent to the General Services Administration (GSA) assigning Endeavour to the science center while also establishing the orbiter's acquisition cost: $1,980,674,785 (not to be confused with a payment price; CSC is only reimbursing NASA for preparation and transportation costs, estimated to be $14.7 million). "How do you put a price tag on something that has been around for 30 years and is a one-of-a-kind piece of hardware?" 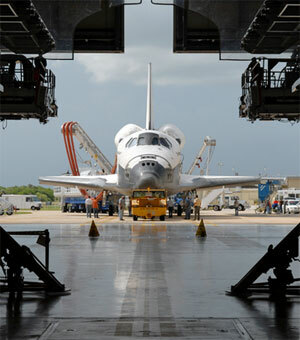 Endeavour's final mission commander Mark Kelly asked, referring to the space shuttles in general. "To come visit it, the price is zero," Steve Soboroff, CSC's senior advisor for its Endeavour plans, added. "The price for all these kids, millions of kids, is zero."